Private label products are goods made by a manufacturer but sold under a retailer’s brand. The private label process isn’t that different from buying products for resale. You still have to source products and suppliers, build a collection, and market them. However, these products carry your brand, not the manufacturer’s. As you’re working on setting up your own private label product, it’s a good idea to have the end goal in sight, which is selling your product, most likely online. For this, you should check out BigCommerce, a website builder and ecommerce platform that offers easy product listings, secure payment processing, and order and inventory management, all in one package. Click below for a free 15-day trial. Now let’s see how to start building your own brand using private label products. Whether you’re a veteran seller or just getting started on Amazon, you’ll need a competitive edge. Download Smart Inventory Management for Increased Profitability from Payability for valuable tips on inventory management, legal tools, cash flow, and more! All sorts products are available from private label suppliers: kitchen goods, electronics, specialty foods, cosmetics and skin care, tools, apparel, and fashion accessories, to name just a few. The real challenge isn’t finding a product that you can private label, it’s finding one that can make you money. Consumer demand, competition, and cost all play a role in a profitable private label program. So careful research is your first step, and here’s how to get started. Even if you don’t plan to sell on Amazon, it’s a great place to research hot-selling products and get ideas for items to sell under your private label. As the world’s largest retailer, Amazon covers every product category imaginable. Better yet, they provide loads of trending sales data that you can use to research top sellers in any niche you want to pursue. What you’ll use for this are Amazon’s Best Sellers pages, where you can drill down and find top sellers in any category or sub-category. Best Sellers pages also give you great insight into customer demand for all sorts of products, plus a good picture of the competition. You can learn all about using Amazon to research potential products in our article on what to sell on Amazon. Google has a secret weapon that lets you see how many people are searching for a specific term online. It’s the Keyword Finder Tool in Google AdWords. This is a great way to gauge buyer demand for products, even if you don’t plan to advertise on Google. Using search terms, you can see how many people search for a specific type of product each month. If no one is searching for it, you’ll likely have a hard time selling it. But if people are searching for it, it might be worth pursuing. 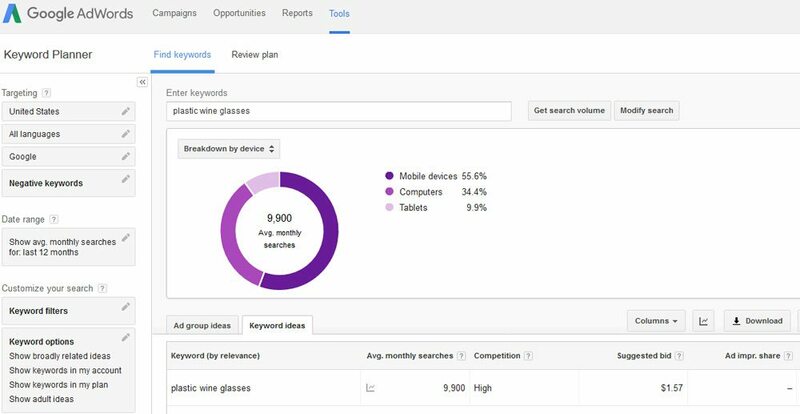 This search data shows impressive demand, but let’s see what else AdWords can tell us in our quest to see if plastic wine glasses are worth selling on a private label. Under the Competition column above, AdWords gives an idea of the competition you’ll face if you decide to sell this item. Here, they rate search terms as High, Medium or Low competition based on how many AdWords advertisers pay to run ads for that particular term. In this case, quite a lot of them target plastic wine glasses since it lists High competition. When starting out in private label sales, products with good search traffic, of say 2000+ searches per month, and Medium or Low competition usually are a better bet. They’ll also be cheaper to advertise on AdWords if that’s part of your marketing plan. Before we move on, the AdWords Keyword Tool gives you more than just search numbers. For example, the graph above shows which devices people use when searching (mobile, desktop, etc.). This data is helpful when planning your website later in Step 7. You can even filter for geographic search data, daily trends, and much more. Learn how to use these features here. Even if you don’t plan to advertise on Google AdWords, this keyword research combined with product research on Amazon can help you pinpoint in-demand products to sell under your private label. Now let’s see how to find private label suppliers for these products. There are many ways to find manufacturers that cater to private label resellers. Where you start your search depends largely on what type of products you want to sell under your private label. Here’s a look at some top places to start your search and we’ll explore each in more detail below. Since you have to pay for goods upfront, usually via wire transfer, it can be nerve-wracking to consider ordering through Alibaba and similar sites. But there are safeguards in place, including Alibaba’s Gold Supplier seller rating. If you stick with reputable marketplaces and use their high-ranked sellers, you should be safe from scammers. If you decide to go this route to source private label products, first search for products you wish to sell. You can include the term private label in your search, but don’t limit yourself on these sites. Once you have a few candidates, contact each supplier to see if they offer private label packaging. Many do even if they don’t mention it in their listing. Also, don’t be afraid to negotiate a lower order minimum or price, many expect this and are willing to negotiate. 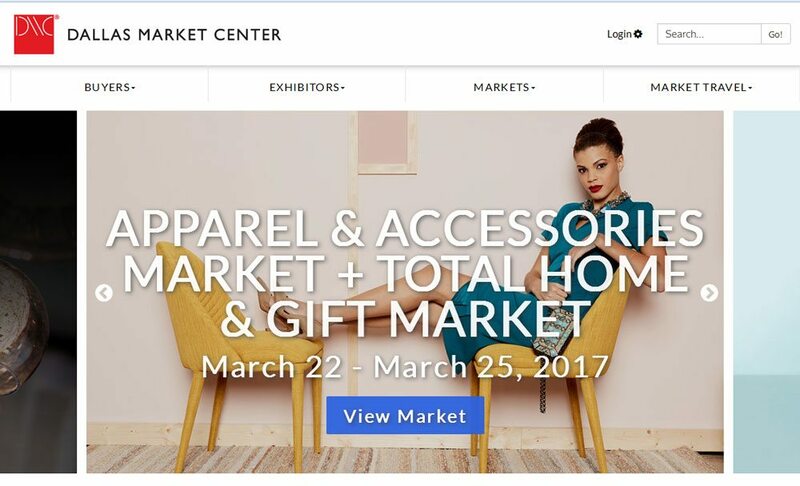 Wholesale buyers markets are one-stop shops for access to manufacturers in every industry, from home decor, to fashion accessories, to specialty foods. These markets hold private label opportunities since all sorts of manufacturers attend and many accommodate private label needs. Armed with a cell phone camera, you can gather loads of manufacturer contact information during visits to the mall, specialty boutiques, and big box stores. Some suppliers send free samples if you’re an established company with a website to show them. But others charge for samples requests from new buyers. If so, it’s usually money well-spent. Product samples give you a chance to fully review your product to make sure it’s what you want to represent your brand. Remember it’s your brand, not the manufacturer’s name, that your customer sees. It must be worthy of your name because you are the one who has to stand behind it. Physical samples also are helpful when designing your product packaging. This step is key to the success of your private label brand. From the look of your logo to package styling, this is where your creativity can help deliver an image to buyers and drive sales. If you don’t have the design skills to craft a logo, labels, or packaging, don’t worry. There are plenty of budget-friendly freelance artists ready to help on Fiverr. Share your brand ideas or samples of a brand look-and-feel that you hope to emulate, and they will craft whatever you need. This includes logo artwork files for various print needs and for website use. Most often, your supplier provides artwork specifications for your custom packaging. Give these specs to your designer and they will create the necessary files to send to your supplier. Using these, the supplier prints packaging and assembles the finished products for you. In some cases, private label suppliers take care of designing your labels or other packaging for you. You just need to forward them your logo. There might even be a reason to print your own specialty packaging and assemble products yourself once they arrive. It really depends on your operation and branding goals. So you’re almost ready to place your private label order. But before you jump in, let’s look at ways to run your operation. Before placing your product order, you need to decide how you’ll store products and get them into your customer’s hands. You need to know this upfront so you can give your supplier the correct delivery address when you place your order. If you plan to sell your private label products in your retail store, this is an easy step. But if you plan to sell online and ship products to buyers, you need to decide how you’ll fulfill orders, meaning how you’ll store products and pack and ship orders. Chances are you’ll want to outsource because handling fulfillment on your own can be time-consuming, expensive, and eat into your profit margins. FedEx Supply Chain is an all-in-one fulfillment provider that helps you with packaging, warehousing, transportation, and even offering your customers free shipping. Click here for a free consultation. Once this step is decided, it’s time to order your private label products. Once you’re happy with the purchase agreement, you can place your order and pay. Wire transfer, credit card, and even PayPal are common payments that suppliers accept. While you wait for your order to arrive, the next step is getting your website and other selling platforms like Amazon up and running. Let’s explore your options. There are several ways you can market your brand and sell private label products. Some sellers stick to their own platform and social channels for all of their sales. Others focus solely on Amazon or sell through both their own website and Amazon. To build a brand you really need to have your own website, even if you plan to sell on Amazon. These big marketplaces bring in the sales, but it’s hard to create a unique identity if that’s your only platform. Plus, if you sell only on Amazon or eBay, you’re at the mercy of their whims. Any day can bring a change to seller fees, requirements that you have to meet, and so on. So here’s a look at several ways you can set up a website and/or sell online through marketplaces. There’s far too much information to cover in detail here, but we have plenty of articles to help you set up the website or selling platform that’s right for you. Square Free Online Store Online sellers and retail stores needing a fast, free all-in-one website that includes payment processing and in-store point-of-sale features See how to launch your Square online store. Ecommerce Platforms like Shopify & BigCommerce Sellers who are primarily focused on product sales and who want to build a volume online selling business with top order and inventory management tools See our comparisons of top-rated dedicated ecommerce platforms. Private label products let you build a brand around a collection of products that you don’t need to manufacture yourself. Many stores and online sellers, large and small, do this with great success, but it takes work to find the right products and manage one or more suppliers. Some sellers find an in-demand item on Amazon and launch their own private label version to sell just on Amazon. Others build a brand around an entire collection of private label products and market them on engaging branded websites. However you plan to sell private label products, the process is the same. From developing a brand idea, to finding the perfect products, to crafting a brand that’s your own, it all takes time and careful planning. But it can pay off big if you’re willing to put in the work. Remember that BigCommerce has everything you need to start and manage an online store, plus it can integrate with some of the largest eCommerce partners in the business. Do you sell private label products under your own brand? We’d love to hear your experiences and thoughts in the comments below. Much more comprehensive piece than others covering the same subject. Good job and thank you! Thank you for reading and commenting, glad the information was helpful. Really, its new concept and useful because we get hard to compete with popular exciting Products in market. This bog explained neatly with new ideas. Thank you for wonderful article. Great job Krista Fabregas. Thank you for reading and commenting. Private label opportunities are opening up new branding opportunities for many. Can I ask – what about the legal side of things? What happens if I private label a food and the customer gets sick from it? Do I need insurance or is the liability with the manufacturer? Is there small print I should put somewhere on the label or website to protect myself and my business? If you’re selling under your brand, even as a private-label seller, you need to protect yourself. The chain usually goes: customer > you > supplier. You’re responsible to your customer and your PLS (private label supplier) is responsible to you. BUT, your PLS can always claim that items weren’t stored or handled properly after leaving their facility, and deny responsibility. It can become a big mess of legal finger-pointing at that stage. Plus, if you sell on Amazon, they require product and general business liability insurance. So there’s your answer if you want to sell on Amazon. Some PLS will have insurance riders that extend to you, so that’s something to ask about. It’s best to take the time to understand these issues up-front and consult an attorney to protect your interests. Thank you, Krista for a great and helpfull article. iI am planning to sell private label supplements on Amazon. Do you know about regulation of private label selling ? How can I register my brand name?Do I have to do it just on Amazon or on USPTO as well? You’ll need to register your business’s trademark with the USPTO, then register that trademark with Amazon. Amazon isn’t a registry, rather, they are now requiring that you have a registered trademark to sell private label personal care products on their marketplace. This does add tasks to your startup, but in the long run, it helps protect your brand from day one, so it’s worth the effort. Good luck!